Dr. Olga Popova of the Russian Academy of Sciences' Institute of Geosphere Dynamics talks about the results of research done by 59 researchers from nine countries on the Chelyabinsk meteor, which crashed to the Earth on February 15, 2013. Why was your article chosen for publication in Science? We submitted the article in late June, after gathering and analyzing all observations available at that time. In particular, we had processed official reports on the destructions [caused by the meteor's atmospheric fly past] and information collected in the course of our own expedition. Never before had this information been published. We had also built a model of the meteor's shock wave and compared it with the effects on the ground. Did you learn anything new about the meteor? We estimated its energy based on a variety of data. For infrasound observations, we were using our own station, as well as stations that were the closest to the area. Our infrasound measurements put the blast energy at 500 kilotons. We also estimated the energy based on the data obtained by United States geostationary military satellites, which are normally used to monitor missile launches and nuclear tests. As a by-product, they register optical atmospheric events caused by meteor re-entries. Based on this information, we appraised the Chelyabinsk meteor's kinetic energy at 590 kilotons. Our other estimate of the meteor's initial kinetic energy is based on measurements of the area on the ground where window glazing was damaged by the blast. Each of these methods is imprecise by itself, but they all are independent, which is important. The Chelyabinsk meteor was electrophonic: witnesses say they heard cracking sounds in the air even as the meteor was flying overhead, i.e. before the sound wave actually reached the ground. Scientists believe such sounds caused by electromagnetic fields generated by the meteor's atmospheric flight. You visited 50 settlements [along the ground footprint of the meteor's flight path]. What exactly were you looking for? It was a small expedition organized by our institute and by the Russian Academy of Sciences' Institute of Astronomy. Our aim was to collect information while the trail was still hot. We were gathering eyewitness accounts and were able to see for ourselves what the broken window glass looked like. We found that the ground damage footprint stretched 90 km (56 miles) across to the meteor's trajectory and had the shape of a butterfly. Your article says that the blast damaged a monument to [Russian poet Alexander] Pushkin. Yes, a Pushkin statue in a Yemanzhelinsk library developed cracks because of the blast wave. A chemical analysis indicates that fragments of the Chelyabinsk meteorite hold traces of organic compounds containing sulfur and oxygen. What were the meteor's parameters? Out of hundreds of available video recordings, we selected around a dozen and aligned the images with the astronomical reference system. This allowed us to determine the meteor's trajectory, entry angle, and speed. It was traveling at 19 km (11.8 miles) per second, measured 18 meters to 20 meters (59 feet by 65.6 feet) across, and weighed 1.3*107 kg. What kind of meteor was it? It was a typical LL-type chondrite. Chondrites account for the lion's share of all meteors entering the Earth's atmosphere. They can be subdivided in three types by their content of iron; the Chelyabinsk meteor belongs to the category with the lowest iron content. However, it can still get registered with a metal detector, attract magnets, and rust. 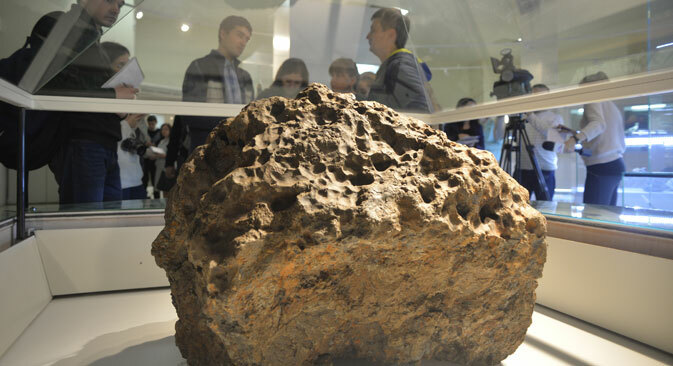 Is there anything about the meteor that remains unclear to scientists? All the principal questions have been answered at least to some extent. It is widely held that, as a rule, only about 10 percent of a meteor's total weight reaches the surface of the Earth. In our case the figure was under 1 percent. Therefore, we still don't know what damage objects sustain when they enter the Earth's atmosphere. The meteor began shining at an altitude of 97.1 km (60 miles), when it first hit the Earth’s atmosphere; its brightness peaked at 29.7 km (18.5 miles), reaching a magnitude of -27.3. For comparison, the Sun's magnitude equals 26.7. This means that the meteor was shining around 30 times brighter than the Sun.